New NAFTA ends ISDS between Canada and U.S. This comment was first published in The Tyee. The best thing about NAFTA 2.0 is that Canada’s economy survived Donald Trump’s volatility. The next best thing is that it will soon reinvigorate our sovereignty. Three years after new NAFTA replaces old NAFTA, the agreement’s special protections for foreign investors will be removed. That is something to celebrate. Thus, our legislatures will soon be able to pass laws that are final — if upheld by Canada’s courts under our Constitution — and free from the threat of having to pay massive compensation to U.S. companies that object to the law. For Canada and the U.S., NAFTA’s special rights for foreign investors have meant that the final word on our laws has been reserved for a tribunal of three lawyers, sitting as “arbitrators,” whose job is to protect foreign investors from risks of democracy, regulation, and courts. These “investor-state dispute settlement” (ISDS) tribunals can award large amounts of public money to multinationals, in some cases even billions of dollars. No international court has such power. National courts are likewise cautious to award compensation in this way because of the challenges it creates for public budgets. Worse, ISDS tribunals are grossly imbalanced. They safeguard investor rights, not investor responsibilities. They do not hear claims by countries against investors. They do not give other actors, who have an interest in the dispute, a basic right of standing in the process. The well-paid arbitrators who sit on ISDS tribunals are also not independent like judges. They depend on foreign investors for income because only the investors can bring the claims that create business for the arbitrators. And many arbitrators work as lawyers in other ISDS cases, creating widespread conflicts of interest. Under old NAFTA and other agreements, the arbitrators have often interpreted investor rights in dubious ways. Vague concepts like “fair and equitable treatment” and “full protection and security” for investors were contorted into a right to receive compensation when general laws are changed for public purposes. Much of the compensation ordered by tribunals has been for expected profits that the investor might have earned, based on speculative assessments. ISDS litigation itself became the investment. Canada is today the most-frequently sued developed country in ISDS. This distinction came mostly because Canada is the only developed country that ever accepted ISDS with the U.S. We did so in NAFTA in the early 1990s when ISDS was rarely used. Americans from across the political spectrum are also repelled by ISDS. U.S. trade representative Robert Lighthizer recently told [at about the 6-minute mark] a U.S. Congressional committee: “we’ve had situations where real regulation which should be in place which is bipartisan, in everybody’s interest, has not been put in place because of fears of ISDS.” If ISDS has made big companies too risky to regulate in the U.S., what are the chances for governments trying to regulate them here? Regulatory chill is the worst cost of ISDS. Behind the scenes, it pushes governments to sacrifice Canadian rights for powerful special interests. Foreign investors can block regulations by pointing to the super-tribunals that protect them alone. Removing ISDS from NAFTA 2.0 does not free Canada from ISDS, but it fixes the biggest problem. The federal government should pursue new agreements —as New Zealand has done under the re-born Trans-Pacific Partnership — to drop ISDS. We should respect each other’s democracies and courts and, if some companies have doubts, they have the option to negotiate for ISDS in their government contracts, buy insurance against political risks, or just decline to invest in unreliable countries. Though much was relinquished in the new NAFTA to avoid a trade war, the demise of ISDS is a historic win for Canada. Gus Van Harten is a professor at Osgoode Hall Law School. He has written several books about ISDS including Sold Down the Yangtze: Canada’s Lopsided Investment Deal with China (Lorimer, 2015). This open letter (version francais) was sent today by Canadian academics, including myself, to the Parliament of Wallonia and Belgian voters. We wrote the letter on Sunday, October 16, after seeing weekend reports of the pressure tactics employed by Canadian politicians and business representatives to influence Wallonia’s decision-making on the CETA. The academics who signed the letter have extensive collective expertise in investor-state arbitration and its impacts on democracy and regulation in Canada. We wish to express our support for the Parliament of Wallonia and have sent our letter to Paul Magnette, Minister-President of Wallonia. In a related development, a parliamentary committee of the Council of Europe has also recently called for postponement of the signing of the CETA due to its implications for national parliaments. Photo courtesy of Stephane Dohet at French Wikipedia and Creative Commons. Tonight’s election debate on the economy takes place against the backdrop of the hard-hit resource sector. Ideally, the debate would touch on how, in September 2014, the Harper government made a big — and thus far spectacularly bad — bet on China. In 2014 the government gave China a long-term investment treaty (aka the Canada-China FIPA, for Foreign Investment Promotion and Protection Agreement) that is clearly lopsided in favour of China. In exchange, the government presumably got positive signals that China would buy and invest in Canadian resources. Since the bet was made, resource prices have plummeted and the Chinese economy is in crisis. Chinese demand for Canadian resources has declined, not grown. The bet will not pay off for some time, if ever. Meanwhile, Canada is now locked in to a lopsided FIPA for a remarkably long and anti-democratic 15-year minimum term. After that, Canada must give one year’s notice to get out of the deal and then wait out the FIPA’s 15-year survival clause. In other words, the government’s give to China was written in the legal equivalent of 31-year cement, while China’s give to Canada was written in sand just before the tide came in. Why is the Canada-China FIPA lopsided? Here are a few examples. Incredibly, the Harper government gave Chinese investors a general right to buy what they want in Canada’s economy without getting the same right for Canadian investors in China. I had never before seen that lopsidedness across hundreds of investment treaties. The government also exposed Canadian taxpayers to much greater risks of liability — in Chinese investors’ arbitration claims for compensation against Canada — due to the larger volume of Chinese asset ownership in Canada than vice versa. The government even kept for itself a unique right to keep any costly settlements between the government and Chinese companies entirely secret, where the government decides that secrecy is “in the public interest”. The FIPA is not all negative for Canada but in striking respects it clearly favours China. China’s handsome take from the deal — basically, a playing field that is tilted in its favour — remains in place for decades. Why would the government do a lopsided deal? After examining the public record on the Harper government’s approach to China, I concluded the most logical explanation was that China promised to support Canada’s resource sector, especially the oil sands. Then, in the months after the Harper government finalized the FIPA in September 2014, the price of oil collapsed. To illustrate, the WTI oil price fell from around $95 in the month before the FIPA’s finalization to around $50 four months later — currently the price sits in the high $40s. More recently, the Chinese economy has been battered as its stock market and real estate bubbles begin to burst, driving a further decline in global demand for resources. For anyone interested in the Harper government’s bet on China — and what a future government can do to mitigate Canada’s losses — please see my book, Sold Down the Yangtze, published by Lorimer last month. You can get it in bookstores or online here. 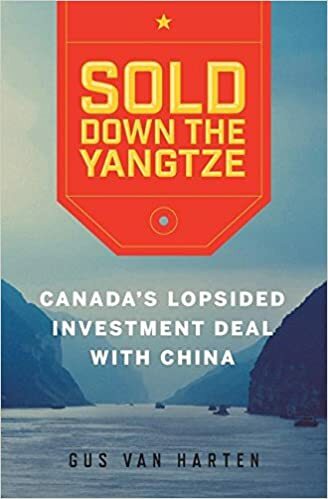 I elaborate below on the Notes from various chapters in my book, Sold Down the Yangtze: Canada’s Lopsided Investment Deal with China, that referred readers to this blog: https://gusvanharten.wordpress.com/. The post is also available as a pdf: Extended notes. More than 90 per cent of money awarded appears to have gone to very large companies or very wealthy individuals: This finding is discussed in a March 2015 post on this blog called “Who was awarded compensation in past ISDS awards?”. Canada as the “safe country” in FIPAs with smaller countries/ uniqueness of the China FIPA: Under the China FIPA, Canada occupies the capital-importing position and is host to large amounts of investment from the other country. Data on capital flows between Canada and its various FIPA partners is provided in the table below, which outlines the amounts of inward and outward foreign direct investment (FDI) covered by Canada’s relevant treaties. The data was compiled by the author from Statistics Canada, Table 376-0051: Foreign Direct Investment (Stocks) in Canada and Canadian Direct Investment Abroad (Stocks) (May 2013). x indicates that confidential data is withheld (typically because the disclosure of limited amounts of FDI to protect the privacy of specific owners); n.a. indicates that data is not available. Annual averages (medians) were calculated by the author and rounded to nearest million. The notes indicate partial coverage where five-year data was unavailable for a country, as follows: (a) 2008-10 only, (b) 2008-09 only, (c) 2008-11 only, (d) 2008-10 and 2012 only, (e) 2008 and 2011-12 only, (f) 2008 only, (g) 2009 only, (h) 2010 only, (i) 2011 only, (j) 2012 only. Armenia n.a. n.a. x/ n.a. x/ n.a. Croatia X x x/ n.a. x/ n.a. Jordan n.a. n.a. x/ n.a. x/ n.a. Figures on potential China investment outflows: The figures are taken from this Response to Questions document. China FIPA environmental assessment and my comment: My comment on the federal government’s environmental assessment was sent as part of the government’s public comment process for the FIPA’s environmental assessment; I did not receive a reply. The full comment was as follows. Thank you for this opportunity to comment on the Final Environmental Assessment of the Canada- China FIPA. For the following reasons, the EA is inadequate and its findings and conclusions should not be relied on as a basis for ratification of the treaty. The EA process, including public comment processes, was conducted largely while the text of the treaty was not finalized and publicly available. The EA does not evaluate the treaty text in light of the claims, awards and decisions of investors or arbitrators pursuant to similar treaties, including NAFTA, CAFTA, the Energy Charter Treaty, and bilateral investment treaties (including other FIPAs). Many such claims, awards and decisions involved the review of decisions by governments in areas of health or environmental protection. These have included the following known cases all of which apparently involved health or environmental decisions by governments at various levels: Aguas del Tunari v Bolivia, AIG Capital v Kazakhstan, Andre v Canada, AWG v Argentina, Azurix v Argentina, Baird v USA, Bayview Irrigation v Mexico, Bishop v Canada, Biwater Gauff v Tanzania, Burlington Resources v Ecuador, CCFT v USA, CGE/ Vivendi v Argentina No 1, CGE/ Vivendi v Argentina No 2, Chemtura v Canada, Chevron v Ecuador No 1, Chevron v Ecuador No 2, Clayton/ Bilcon v Canada, Commerce Group v El Salvador, Dow v Canada, Ethyl v Canada, Frank v Mexico, Gallo v Canada, Glamis Gold v USA, Grand River v USA, Greiner v Canada, Howard/ Centurion Health v Canada, Kenex v USA, Lucchetti v Peru, Metalclad v Mexico, Methanex v USA, Pacific Rim v El Salvador, Philip Morris v Australia, Philip Morris v Uruguay, Plama v Bulgaria, SD Myers v Canada, Signa v Canada, Suez & InterAguas v Argentina, Suez & Vivendi v Argentina, Tecmed v Mexico, Vattenfall v Germany No 1, Vattenfall v Germany No 2. Please note that this is not an exhaustive list due to the confidentiality associated with claims and arbitrations under these treaties. The existing record of claims, awards, and decisions should be assembled and reviewed with care to assess the liabilities and constraints that governments in Canada will assume in relation to the Canada-China treaty in fields of health and environmental protection, among others. To provide a baseline for such assessments, estimates should be developed of existing and anticipated volumes of inward Chinese investment and relevant sectors/ major projects in Canada over the minimum 31-year lifespan of the treaty. The EA process to date generated a conclusion that the treaty would have no environmental impact based on the assumption that there was no causative relationship between the treaty and inward Chinese investment. However, the special rights and protections extended to Chinese-owned assets, including in relation to health or environmental measures of governments, will exist under the treaty regardless of any causative relationship between the treaty and the relevant Chinese ownership. For this reason, to provide a meaningful evaluation of liabilities and constraints, the assessment must be based on existing and anticipated levels and sectors of Chinese ownership. Further, to predict the types of activities in which Chinese-owned assets may be engaged in Canada over the 31-year minimum lifespan of the treaty, assessments should be provided of relevant activities of Chinese-owned entities to date in Canada and other countries. The scope of the EA should be expanded to include assessment of the health and environmental impacts of Canadian investment abroad under the treaty. In light of these comments and inadequacies, a process allowing for thorough, independent, and public review of claims relating to the treaty, including on the treaty’s implications on the ability of governments at all levels in Canada to take decisions that protect health and the environment where either are affected by activities of any wholly or partially Chinese-owned entity, should be conducted before the government ratifies the treaty. It would be imprudent to proceed with ratification in the absence of such assessments of the fiscal liability and effective legal constraints to be assumed under the treaty by governments at all levels in Canada and, in turn, of the impacts on health, the environment, and livelihoods of Canadians. Thank you again for this opportunity to comment. Billions in compensation for foreign investors since 1990s: This finding is discussed in a March 2015 post on this blog called “Who was awarded compensation in past ISDS awards?”. Exposure of early NAFTA lawsuit against Canada: A confidential source, interviewed for a research project by Osgoode Hall law professor Dayna N. Scott and myself on investment treaties and regulatory change, worked for the federal government and commented as is indicated below. Interviewee: … The first [NAFTA ISDS] cases, when SD Meyrs was started, the government didn’t announce it. They didn’t say anything. And there was a public consultation for civil society groups and labour on the MAI [Multilateral Agreement on Investment] negotiations. And at that meeting, someone in the labour union said, I heard there’s a new case, a second arbitration. That’s when Foreign Affairs lied outright and said no. He said no, no I’m sure I know this second case, and the guy from Foreign Affairs said no. He absolutely flat out lied. Interviewer: Do you remember who it was? Interviewee: No. Then the same guy who was asking the questions, asked Environment Canada’s rep at the meeting. Can you confirm that there is in fact no second case, or is there a second case? He goes, can you confirm what your colleague in Foreign Affairs said? He goes, no. And so the second case was out-ed…. NAFTA case of St. Marys v Canada: A confidential source, interviewed for a research project by Osgoode Hall law professor Dayna N. Scott and myself on investment treaties and regulatory change, worked for a provincial government and was involved in litigation meetings for the St. Marys case. The source commented as is indicated below. Interviewer: … basically, from what I understood, the first time you’d heard of NAFTA was the St. Marys case? Interviewee: No, I’d heard of NAFTA before that, but I really hadn’t lived and breathed it until I got involved in my own case and really started to understand the um, well just the level of effort that – I was amazed at how much effort goes into fighting these things. Interviewer: Like how many lawyers would you say, provincial and federal, did you see involved? Interviewee: Well, it’s not just lawyers. It’s people like me, at a senior bureaucratic level. So you got teleconferences every week dealing with you know, four or five ministries, and there’s a rep from every ministry, that’s like me, I’m not a lawyer. Because lawyers are clients after all, they don’t make decisions, they just give advice. So you’ve got four or five lawyers, you’ve got four or five uh, and you’ve got ten people from the province, eight people from the feds, and you’ve got teleconferences every week. And it’s just you know, and the money being spent too. Because you know, feds, well we want to hire investigative firms to do this, and we’ve got to hire, it’s like, the amount of money that is spent, I wouldn’t want to think about how much money was spent on that. And we didn’t recover costs either…. Interviewer: So it would be well and above a typical litigation, an enforcement litigation or something? Interviewer: For sure. So there was good coordination, federal, provincial, in handling the case, and working out how to settle it, resolve it? Interviewee: Yeah you’ve got Municipal Affairs, you’ve got MNR [Ministry of Natural Resources] because they give aggregate licenses. Interviewer: MAG [Ministry of the Attorney General]? Interviewer: Oh, maybe Economic Development and Trade? Interviewee: Yes, yes, they were there too. They want to know what’s going on, how that plays out with the economic credit in Ontario. Everybody wants to know, get involved in something like that sometimes, just to have somebody on the phone so they can report back, right? Interviewee: Yes. And again, I’ve never had any experience, other than the one. Interviewer: So your take away from that experience was, the main thing was: you were amazed at how extensive the litigation response was? On the surface, the Ethyl dispute appears to be a case-in-point for regulatory chill…. According to some, the Canadian government’s settlement with Ethyl demonstrated the government caving to corporate interests and set a dangerous precedent for future environmental regulation. The reason for the settlement, however, actually cuts against the regulatory chill argument. The Canadian government only agreed to settle the dispute after Canada’s own provinces successfully challenged the legitimacy of the law in Canadian court. The dispute settlement panel invalidated the measure after finding that it exceeded the scope of the government’s authority. Thus, this case does not support the notion of regulatory chill because the act of regulation itself was not legal. Ethyl’s arbitration claims cannot accurately be described as threatening policy space because the government was not allowed to regulate the policy space as it did. This summary of the Ethyl v Canada case has four inaccuracies: (1) it attributes the federal government’s decision to settle to the Agreement on Internal Trade (AIT) panel’s decision alone; (2) it claims that the AIT decision came from a Canadian court; (3) it suggests that the AIT panel issued a binding determination when in fact its decision was a recommendation; (4) it confuses the issue of inter-provincial trade under the AIT with the issue of international trade under NAFTA, which was not the subject of the AIT decision. Limited coverage of investment treaty arbitration at present/ more than half of cases brought under just 17 treaties: To the spring of 2010, over half of all the known investment treaty cases were brought under only 17 treaties: NAFTA, the Energy Charter Treaty, and 15 bilateral investment treaties of the United States. This includes 61 cases under NAFTA, 24 cases under the Energy Charter Treaty, and 44 cases under U.S. BITs with Argentina, the Czech Republic, Ecuador, Egypt, Estonia, Georgia, Jordan, Kazakhstan, Moldova, Romania, Sri Lanka, Trinidad and Tobago, Turkey, Ukraine, and Zaire. The data reflects all 249 known cases with a publicly-available award (or, for NAFTA cases, a notice of intent to arbitrate) by cut-offs in the spring of 2010. Reliance by judge on government expert’s misleading portrayal/ Government expert’s selective reference to cases: In Hupacasath First Nation v Canada (Foreign Affairs) (2013), 2013 FC 900 (CanLII), paras. 73, 95, 129, and 134, the judge relied on J. Christopher Thomas’ opinion to conclude that the China FIPA is “designed to protect and promote investment between Canada and China by ensuring basic legally binding rights and obligations to investors”. The judge also accepted Thomas’ specific view that the obligation in article 4 of the FIPA “is considered to be a basic standard of treatment that all members of the international community are capable of meeting”. Following Thomas, the judge then cited two NAFTA awards that were exceptionally country-friendly, meaning that they went against the position of the foreign investor that brought the claim: Glamis Gold v U.S. and Mobil/ Murphy Oil v Canada. These aspects of the judge’s decision were based on misleading statements, as I elaborate here, focusing—as Thomas and the judge did—on the NAFTA experience. The guarantee of ‘fair and equitable treatment’ in [NAFTA] Article 1105(1) has received close attention in NAFTA arbitrations. Tribunals have analyzed Article 1105(1) in light of the background principle of international law that foreign investors are entitled to a certain level of treatment from the state in which they invest. This fundamental principle of international law has been expressed using two different rubrics: (i) as the minimum standard of treatment of aliens under customary international law (Minimum Standard of Treatment); and (ii) as the standard of Fair and Equitable Treatment that has been adopted by most international investment treaties in force today and that has been interpreted and applied in numerous decisions of international tribunals…. … NAFTA and non-NAFTA tribunals have recognized that the Minimum Standard of Treatment has evolved to the point that it now affords foreign investors the same level of protection as the autonomous Fair and Equitable Treatment standard. In Merrill & Ring v. Canada, for example… the tribunal noted that the ‘requirement that aliens be treated fairly and equitably in relation to business, trade and investment is the outcome of this changing reality and as such it has become sufficiently part of widespread and consistent practice so as to demonstrate that it is reflected today in customary international law as opinio juris.’ And in Biwater Gauff v. Tanzania, the tribunal similarly concluded that ‘as found by a number of previous arbitral tribunals and commentators, … the actual content of the treaty standard of fair and equitable treatment is not materially different from the content of the minimum standard of treatment in customary international law.’ These decisions both reflect customary international law and contribute to its formation by adding texture to the Minimum Standard of Treatment as it has been applied on the facts of particular cases. I am not saying here that one U.S. investor’s view on the NAFTA concept of fair and equitable treatment is correct, but Eli Lilly’s submission—developed by competent lawyers from reputable firms—shows that many tribunals, even under NAFTA alone, have taken the concept of fair and equitable treatment beyond a basic meaning derived from customary international law. The important point is that Thomas’ portrayal of the obligation in article 4 of the FIPA—as a basic standard that all countries can meet—was misleading. His portrayal downplayed the differences among NAFTA decisions on this issue, many (probably most) of which contradict him. It also ignored numerous tribunal decisions under other investment treaties that take the concept beyond any basic meaning. It also did not account for a FIPA loophole—created by the FIPA’s unique approach to MFN treatment—which undermined the post-2001 moderating provisions in article 4(2) and (3), for example, of the FIPA. Second, Thomas’ opinion was also misleading because it focused on a few NAFTA cases that are exceptionally country-friendly (usually, U.S. friendly). He put special emphasis on Glamis Gold v U.S., mentioning it nine times in his opinion. This case was also cited by the judge when he characterized the FIPA’s obligations as basic. Yet, the Glamis decision is probably the single most country-friendly tribunal decision under NAFTA, especially in its handling of the concept of fair and equitable treatment. Indeed, it is arguably the most country-friendly tribunal decision to date under all investment treaties. The [Glamis] tribunal’s holding that the minimum standard of treatment has not evolved significantly… stands in sharp contrast with several recent arbitral decisions and the writings of various commentators. The Glamis award therefore represents an important moment in [NAFTA] chapter 11 arbitration by introducing an orthodox reading of [fair and equitable treatment] under NAFTA and a significant divergence from a growing body of jurisprudence on the correct approach to [NAFTA] article 1105. The [Glamis] decision stands in stark contrast to the recent trend in arbitral awards and commentary that views minimum standards under customary international law as fluid and evolving concepts. These sources demonstrate that the Glamis decision does not reflect the mainstream of ISDS decisions under investment treaties. They also convey why it was a problem for Thomas to describe Glamis as “a typical approach taken by a tribunal when considering a country’s domestic law in an investment treaty arbitration”. Thomas cherry-picked other country-friendly NAFTA decisions to downplay the risks and constraints from Canada’s FIPA obligations, though none to the extent of Glamis. For the record, others included the country-friendly rulings in Loewen v U.S., ADF v U.S., Azinian v. Mexico, and Chemtura v. Canada. I discuss these cases—a rare examples of arbitrator restraint in ISDS—in my systematic study of this issue across a wide pool of about two hundred cases: G. Van Harten, Sovereign Choices and Sovereign Constraints (Oxford University Press, 2013). I relied on this systematic research when providing my own expert opinion to the court, which the judge discounted for reasons I discussed in chapters 25 and 26 of Sold Down the Yangtze. I am an expert in investment treaties. As a Canadian, I am deeply concerned about the implications for Canada of the Canada-China investment treaty. As I understand, the treaty is slated for ratification by your government on or about October 31. I hope you will reconsider this course of action for these reasons. The legal consequences of the treaty will be irreversible by any Canadian court, legislature or other decision-maker for 31 years after the treaty is given effect. The treaty has a 15-year minimum term, requires one year’s notice prior to termination, and adds another 15-years of treaty coverage for assets that are Chinese-owned at the time of termination. By contrast, NAFTA for example can be terminated on 6-months notice. Other investment treaties (aka FIPAs) signed by Canada have a similar duration and, in this respect, are exceptional among modern treaties. Yet none put Canada primarily in the capital-importing position. As such, the Canada-China treaty effectively concedes legislative and judicial elements of our sovereignty in a way that other FIPAs do not. Chinese asset-owners in Canada will be able, at their option, to challenge Canadian legislative, executive, or judicial decisions outside of the Canadian legal system and Canadian courts. To elaborate, the treaty will likely be largely de facto non-reciprocal due to anticipated in-flows of Chinese investment to Canada outstripping Canadian investment in China. The deal gives Cadillac legal status to Canadian investors in China and vice versa. Yet Canada will be much more exposed to claims and corresponding constraints as a result of the de facto non-reciprocity. Two awards of a billion dollars-plus, and many over $100 million, have been issued against countries to date under these treaties, with more likely on the way. The awards are immune from judicial review, largely or entirely, and are often extra-territorial, depending on how the investor’s lawyers frame the claim. Usually, the capital-importing position under these treaties is occupied by a developing or transition economy. Under the Canada-China treaty it is occupied by Canada. This poses a serious fiscal risk. Notably, to sue under the treaty, a Chinese company requires only a minority share in any Canadian enterprise or other asset in Canada. Based on interpretations by arbitrators in numerous cases, a Chinese investor could obtain, or may already have obtained, ownership in Canadian assets via a holding company in a secrecy jurisdiction such as the Cayman Islands, without losing its right to sue under the Canada-China treaty. What steps have you taken to ensure that there is not now and will not be in future Chinese-ownership of assets of which the government is unaware? The only comparator for Canada in terms of fiscal risk is NAFTA. Canada has been sued about 30 times under NAFTA Chapter 11 although many cases were minor. Canada has paid out around $170 million in compensation in four cases to date. Other countries have been ordered to pay much more. Our biggest loss apparently came last May in a claim by Mobil Oil/ Murphy Oil involving R&D expenditure requirements in the Hibernia and Terra Nova projects. To my knowledge, a damages award has not yet been issued in that case although Canada was found by the arbitrators to have violated NAFTA. The decision reportedly undermined Canada’s standard approach to reservations in investment treaties with potential implications for the Canada-China treaty. It is not possible to confirm this because your government has not released the Mobil/ Murphy award against Canada (see http://www.italaw.com/cases/1225) in spite of your commitment to openness in these arbitrations. Would you please send me a copy of this award? In terms of the fiscal risks, the Canada-China treaty goes beyond NAFTA in important respects and probably increases Canada’s exposure to lawsuits under NAFTA itself, on a non-reciprocal basis. Under NAFTA, the fiscal risk is contained by carve-outs of existing state and provincial measures from various NAFTA disciplines. The Canada-China treaty goes beyond NAFTA by extending a ban on performance requirements to existing provincial measures, including legislation. This ban will extend to Canadian provincial treatment of U.S.-owned, as well as Chinese-owned, assets due to the most-favoured-nation requirement under NAFTA. However, Canadian investors in the U.S. will not receive reciprocal treatment in relation to U.S. state measures. This will likely frustrate the ability of any federal or provincial government to ensure that value-added benefits of resource exploitation in Canada accrue reasonably to Canadians. Have you analyzed the risk-benefit comprehensively in light of all existing provincial measures? Other legal protections that will be extended to Chinese investors under the treaty involve topics of expropriation and fair and equitable treatment, among others. These concepts sound straightforward but arbitrators in many cases have taken them in unanticipated and investor-friendly directions by requiring public compensation for foreign firms whose “legitimate expectations” were not met by a government or who were denied a “stable regulatory framework” over the lifespan of an investment. These arbitrator-made disciplines are far- reaching because they may preclude any changes to legislation that affect negatively a Chinese investor, without taxpayer compensation to the investor for its business losses. The possibility of the arbitrators reading such requirements into the Canada-China treaty adds to the fiscal risk and illustrates the concession of sovereignty under the treaty. So-called “stabilization clauses” are usually found in investment contracts signed with governments in developing countries, not treaties agreed by Canada. The arbitration process itself is a long story. Briefly, it does a lot for the lawyers and arbitrators in the field, for investors from major capital-exporters (here, China or the U.S.), and for major multinationals able to entangle governments in never-ending legal contests of attrition, especially in the resource sector. Philip Morris has used these mechanisms to attack, for example, anti-tobacco measures in Australia and Uruguay. On the other hand, the arbitration process does little for, and may harm, anyone else. Above all, the process is not judicial in the manner of domestic or international courts and thus not reliably independent. Canadian investors have never won compensation in any of their 16 known lawsuits against the U.S. and other countries under NAFTA and FIPAs. I have not heard this mentioned by Canadian lawyers and arbitrators who champion these treaties. It may be that Canadian companies have benefited by their ability to pressure governments to settle disputes in cases that are not public, but if so this reaffirms the danger that Chinese investors will pressure governments in Canada to back away from laws or regulations without public knowledge. Because the arbitrators under the Canada-China treaty operate outside of the authority of the Canadian legal system and Canadian courts, the treaty appears to contravene the judicature provisions of the Constitution concerning the role of the superior courts. In various historical cases, the Supreme Court of Canada struck down legislation that contained broad privative clauses precluding review of tribunal decisions by the superior courts. The treaty’s transfer of judicial authority to arbitrators is analogous and, arguably, more far-reaching. Notably, the arbitrators may make non-monetary orders against states as well as issue damages awards for potentially massive amounts. The treaty clearly impacts on provincial powers on natural resources, taxation, land and property rights, and other matters. It applies to provincial legislation, regulations, or court or tribunal decisions that affect Chinese-owned assets, with limited exceptions. It does not contain a NAFTA-style carve-out for provincial performance requirements or any carve-outs for provincial measures regarding the treaty’s expropriation and fair and equitable treatment provisions. Thus, there is a real possibility that, over the lifespan of the treaty, Canada will face billion dollar-plus awards due to provincial decisions that are not reviewable in Canadian courts. Does your government intend to assume the fiscal risk and have you obtained formal provincial consent for the proposed ratification of the treaty in light of its constitutional implications? This treaty will have major implications for core elements of Canadian legislative and judicial sovereignty. It will tie the hands of all levels and branches of government in Canada in relation to any Chinese-owned asset in ways that many governments in Canada, I suspect, have not considered closely. The implications will be legally irreversible by any Canadian court or other decision-maker for at least 31 years. I urge you please to reconsider your decision to proceed with ratification of this treaty, without provincial consent or a serious public debate, on or about October 31. I request replies to the questions posed in paragraphs 4, 5, 6, 7, and 12 above. Open letter to Prime Minister Harper: The letter is reproduced in full in the note for chapter 25, above. Many arbitrators have decided that a merely substantial or significant (or similar language) reduction triggers duty of full compensation for indirect expropriation: In a review of all known ISDS cases with a publicly-available award to the spring of 2010 alone, I identified with the help of a research assistant 19 cases in which the tribunal, or a majority of the tribunal, took this claimant-friendly approach to the concept of indirect expropriation. The 19 cases were BG Group v Argentina; CMS v Argentina; Metalpar v Argentina; Saipem v Bangladesh; Merrill & Ring v Canada; Pope & Talbot v Canada; Eastern Sugar v Czech Republic; Encana v Ecuador; MCI Power Group v Ecuador; Occidental v Ecuador (No 1); Wena Hotels v Egypt; Rumeli Telekom v Kazakhstan; Feldman v Mexico; Waste Management v Mexico (No 2); Bogdanov v Moldova; Link Trading v Moldova; Biwater Gauff v Tanzania; PSEG v Turkey; and Tokios Tokeles v Ukraine. Minimum terms and survival clauses in FIPAs: The minimum terms, if any, and the survival clauses in Canada’s FIPAs are outlined below. The data was compiled by author based on FIPA texts available from Foreign Affairs, Trade, and Development Canada as of January 26, 2014. Wayne Easter questions and replies from trade officials: The questions posed by Mr. Easter and the responses from federal trade officials are posted here: Questions about the FIPA and Response to Questions. Potential for conflict and ongoing liability: A majority of the tribunal in Mobil Investments Canada Inc and Murphy Oil Corp v Canada, Decision, May 22, 2012, ICSID Case No. ARB(AF)/07/4, took a narrow approach to Canada’s carve-out in NAFTA of legislation authorizing the decisions of the Newfoundland and Labrador Offshore Petroleum Board that were challenged by the U.S. companies in the NAFTA claim. The tribunal then indicated that, if the decisions on research and development spending requirements for the U.S. companies were kept in place, Canada would potentially owe damages until 2036. As a result, the U.S. companies’ costs arising from decisions by an independent federal-provincial regulatory board, which were upheld in Canadian courts, must by order of a NAFTA tribunal be paid by the federal government in compensation to the U.S. companies. FIPA secrecy point conveyed in open letter to Prime Minister: The letter is reproduced in full in the note for chapter 25, above. China expected to invest as much as CDN$1 trillion by 2020: The figure is taken from this Response to Questions document. Lawyers at the Canadian Bar Association and Canada’s ratification of the ICSID Convention: For examples of the Canadian Bar Association (CBA)’s lobbying in support of Canada’s ratification of the ICSID Convention, see this CBA letter from 2005 and this CBA letter from 2007. Among other things, the CBA told decision-makers that ICSID’s history makes it “abundantly clear that the benefits of membership are immense and there are no obvious costs.” This claim is hard to square with the lack of evidence of ICSID’s relevance to foreign investment decisions. Also, the statement that ICSID membership carries “no obvious costs” is risible when one considers the financial risks of ICSID arbitration for governments. I say more about Canada’s ratification of the ICSID Convention in 2013 here and here. China FIPA has longest lock-in period among Canada’s relevant treaties: This relevant data is laid out in a note for chapter 34, above. Q And it appears to me that is the longest term of any FIPA that Canada has entered into. Is that correct? Q And what are the termination provisions for NAFTA? A The NAFTA has no mandatory period that the treaty must be in force. It can be terminated with a year’s notice, and existing investments as of the termination date are covered for a further 15 years. This is another example of an inaccuracy in the federal trade official’s testimony. In fact, NAFTA can be terminated on six months’ notice and has no survival clause for existing investments. In Chapter 26 of my book Sold Down the Yangtze: Canada’s Lopsided Investment Deal With China, I said that I’d post on this blog documents from my complaint to the Canadian Judicial Council (CJC) and the CJC’s reply. The documents are attached below. They include items mentioned elsewhere in the Notes for my book, such as the federal government’s memorandum alleging that I lacked impartiality as an expert and the Hupacasath First Nation’s reply. CJC complaint letter (24 September 2014). Appendix A to CJC complaint letter: Hupacasath v Canada decision of Federal Court. Appendix B to CJC complaint letter: Certificate and expert opinion of G Van Harten. Appendix C to CJC complaint letter: Opinion articles of G Van Harten. Appendix D to CJC complaint letter: Opinion article of P Crampton. Appendix E to CJC complaint letter: Cross-examination of G Van Harten. Appendix F to CJC complaint letter: Cross-examination of JC Thomas. Appendix G to CJC complaint letter: Memorandum of federal government. Appendix H to CJC complaint letter: Reply submission of Hupacasath First Nation. Appendix I.1 to CJC complaint letter: Hearing transcripts of day one. Appendix I.2 to CJC complaint letter: Hearing transcripts of day two. Appendix I.3 to CJC complaint letter: Hearing transcripts of day three. CJC reply letter (12 March 2015).